The arrow on this planning department sketch points to where the medical office building will go. 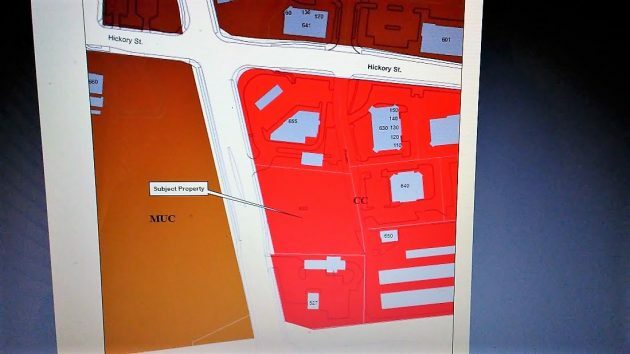 Albany city planners are reviewing not just one but two proposed site plans for commercial buildings in North Albany. They’ve just notified neighboring property owners of both. One is the site plan for the outdoor garden center of the Ace hardware store that’s supposed to take up about one-third of the interior space of the planned Myers grocery in the North Albany Village shopping center. I reported on Nov. 13 that the site plan had been filed. Now the application is complete and is being reviewed. When it’s approved by the planning staff, in a matter of weeks, perhaps The Myers Group, based in Clinton, Wash., will get going on preparing the long-awaited grocery store, which besides the hardware store and garden center will have a liquor store as well. The site of the planned medical building is owned by a Medford-based LLC whose principals previously rebuilt a former hospital in Roseburg for state offices. The architect of the Albany project is TvA of Portland. The plan includes a parking lot with 66 spaces plus four covered spaces for bikes. A drawing of the outdoor garden center on the west side of the planned Myers grocery and Ace hardware store. Who will occupy the medical building? Corvallis Clinic or Samaritan Health? They are pretty much the only games in town. We desperately need a grocery and drug store in North Albany, but I question the need for a garden center. There is one just a 1/4 of a mile away (locally owned!! ), plus the ones at Lowes and Home Depot. These look like good additions to the commercial property already in place. As to having a second garden center, it’s the essence of capitalism: competition. Is it possible that it’s Kaiser Permanente? I’ve heard rumors and have seen that they are hiring in Albany. Does this development fall under the aegis of CARA ? I was recently at Corvallis Clinic and was told their N. Albany location lease is expiring. They hope to build 2 story building in location between car washes and add more doctors.